Oh my goodness. I just realized how much time has passed since I posted about the plans for our laundry room redesign. We completed this room makeover a few months ago, and I’m just now sitting down to write the reveal post (can’t wait to share the dramatic Before and After photos on this one!). But before I pull back the curtain for this particular reveal, I wanted to spend a bit of time zeroing in on one particular design choice we made for this project — selecting luxury vinyl tile flooring. One of the most ambitious projects we plan to tackle in our whole home renovation is replacing the existing flooring throughout the first floor. Our current flooring consists of 11-year old builder-grade carpeting, and outdated orangy-oak hardwood floors (which I’ve disliked since the day we moved in). There was also sheet vinyl flooring in the laundry room that had definitely seen its better days. And so our global flooring replacement project began in this room. We’ve been discussing new flooring options for what seems like a few years now. I thought I had settled on wood grain tile for the laundry room. But as I began to get serious about sourcing the flooring for this space, I found myself drawn to luxury vinyl tile (LVT) flooring options (which closely mimic the look and feel of the popular wide-plank hardwood flooring). 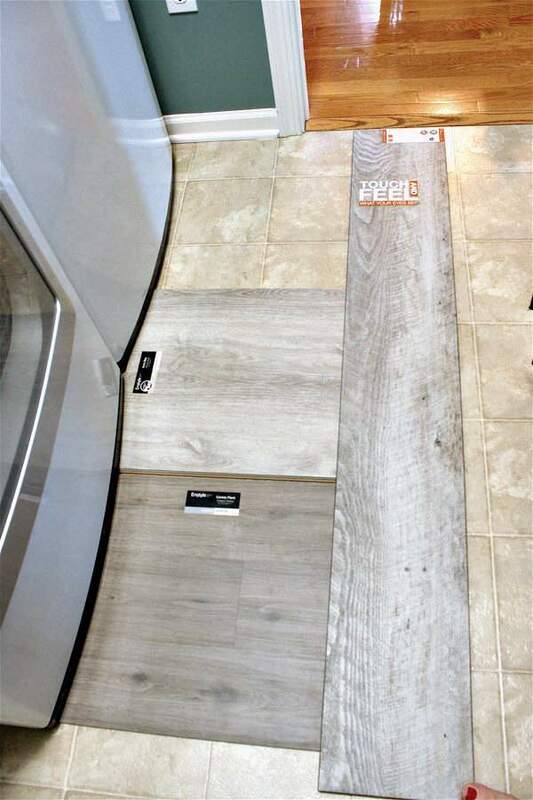 I was even more intrigued when the flooring experts at our local high-end home improvement store explained that this flooring material was the flooring of choice among local home builders currently building showcase homes in the area. Hmmm…. 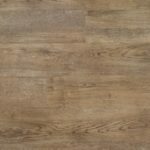 Since one of my hesitations about installing LVT flooring throughout our home was how it might potentially affect our homes’ resale value, the flooring experts’ endorsement really sealed the deal for us. Take a peek at these flooring samples. Would you have ever guessed that they were NOT wood? I think not! Luxury vinyl tile flooring has come a looonnnggg way in the past few years as far as aesthetics are concerned. It’s designed to simulate both the look and feel of hardwoods. Like their hardwood counterparts, you can choose planks with a smooth finish, or ones that have the popular handscraped texture. Another benefit of choosing this type of flooring is that it’s super easy to install. If you’ve got the time (and the minimal carpentry skills the project requires), this is a great DIY project. In our case, we chose to take the easy way out and pay the home improvement store to install the floor (since my Hubby’s travel schedule these days doesn’t allow for many DIY projects). 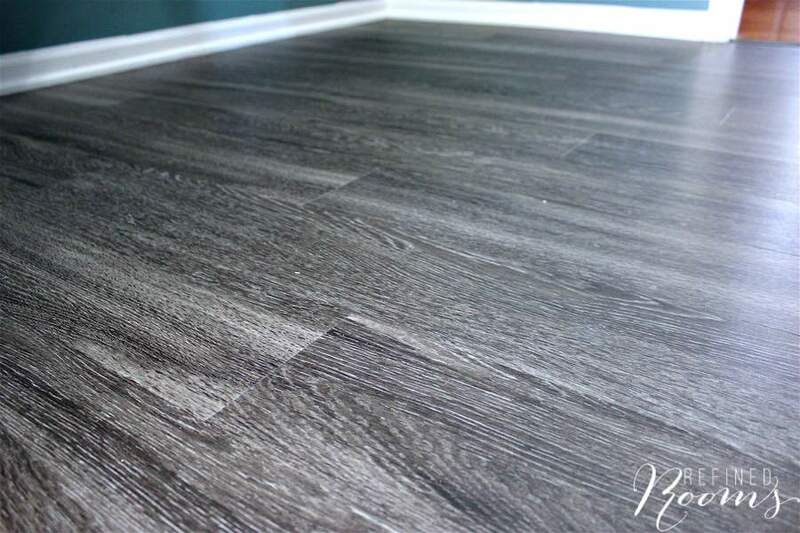 The cost per square foot to install our luxury vinyl plank floor was 1/3 the cost of installing hardwoods or tile flooring. As I watched the install process take place, I could quickly see why. In 90 minutes, the project was completed! No glue. No sanding. No mess. Gotta love it! The only thing left was to purchase some gel stain so that I can stain our door threshold to match the new flooring. 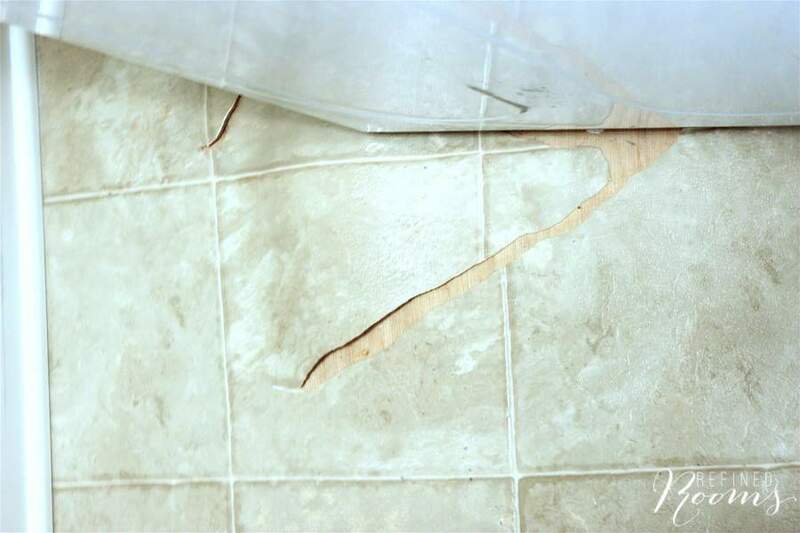 We’ve had 11 years of experience observing the havoc that kids, pets, and simple everyday living can wreak on flooring. The carpet is stained, the sheet vinyl in the laundry room was ripped to shreds, and the existing hardwoods are scraped and warped from water damage. We want to be able to live in our home without having to worry about the floors getting damaged. The mantra I’ve heard from the flooring experts and installers about luxury vinyl tile is that “these floors are tough as nails”. This has definitely held true for the laundry room floors (which have been installed for several months now). We’ve been able to move our washer/dryer around without so much as a scratch on the floor. Not only does LVT flooring resist scratching, it’s also extremely water resistant (some go as far as to claim that they are waterproof). According to our installer, it’s the only type of flooring that would NOT have to be replaced in the event of a flood. It’s unlikely that we’ll ever experience a flood here. But…there’s always the chance in the laundry room that the washing machine hose could break, right? SOLD. 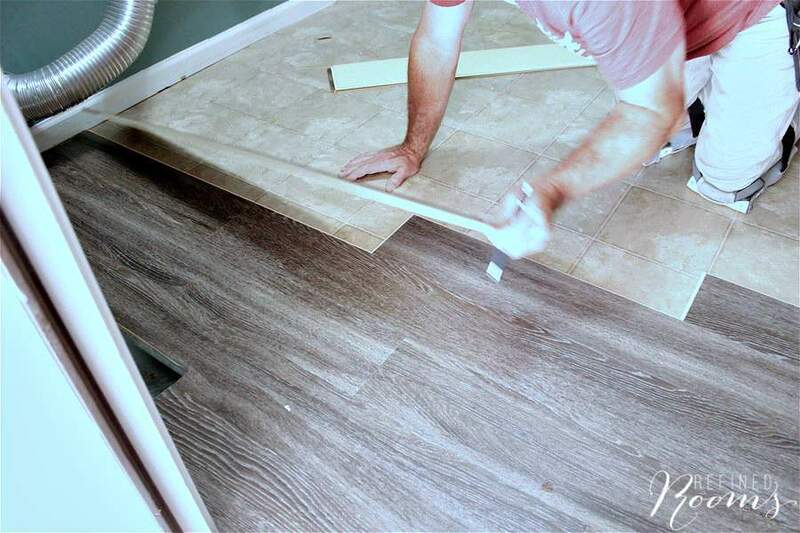 When we priced out what it would cost to replace all of the flooring on our first floor with wide plank hand-scraped hardwood flooring vs. a comparable luxury vinyl tile flooring, we were blown away at the cost difference. The LVT flooring project was roughly 1/3 of the cost of the hardwood flooring project…yikes! That’s a major cost difference when you’re talking about 1,300 square feet of flooring. There’s also an opportunity to keep the project cost down even further if we choose luxury vinyl tile flooring. 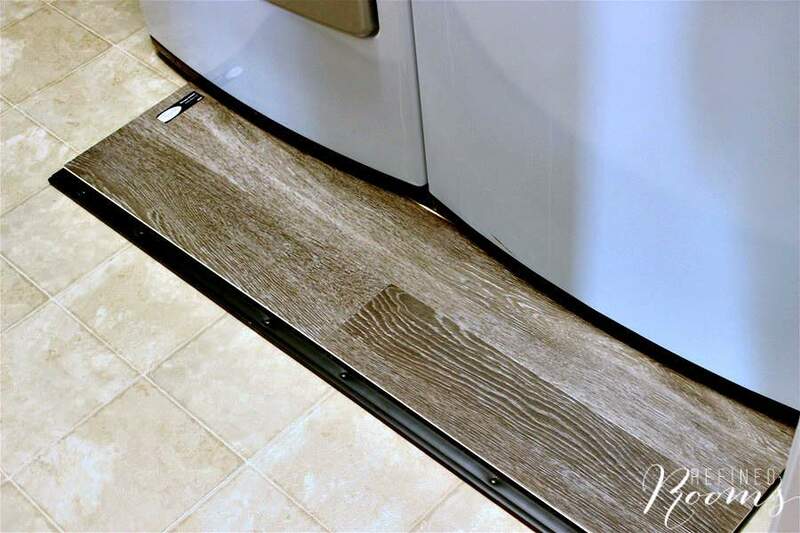 We know from observing the laundry room install that the skill level involved with this type of floor installation is well within our DIY wheelhouse, so….we could avoid installation costs altogether. When the time comes to tackle this project, the only thing that will hold us back from installing it ourselves will be the level of chaos in our life (sometimes we value time even more than money these days!). In contrast, if we chose hardwood flooring, we’d definitely need to bite the bullet and incur the labor costs associated with hiring installers. I’m not as confident in our ability to tackle the more complex carpentry tasks involved with installing hardwood up the stairs (which we would do with hardwoods, but not luxury vinyl tiles). So which flooring product did we actually select for our laundry room?? 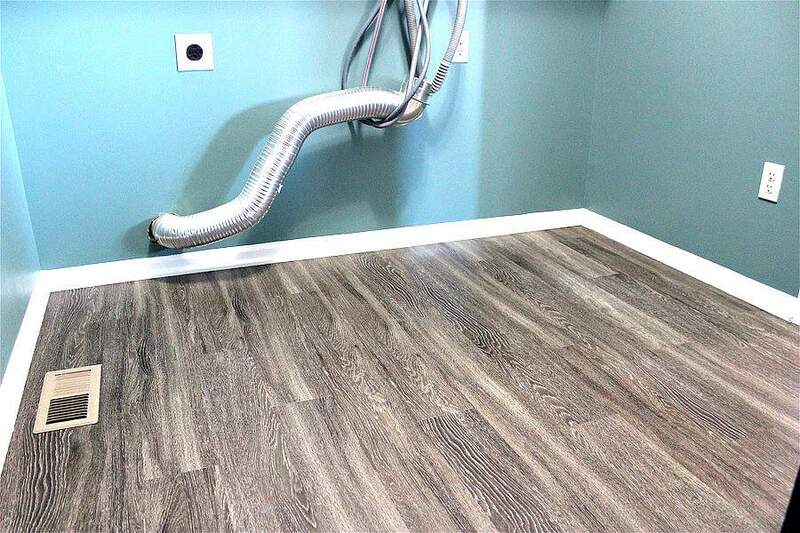 We chose Shaw Floorte Premio flooring in the Duca color for the laundry room. 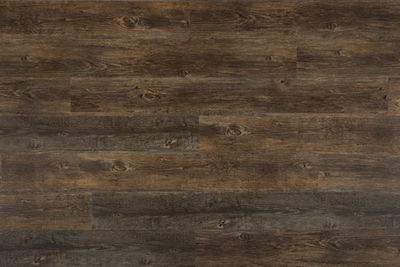 After looking at sample after sample of gray/brown-toned flooring, we kept coming back to this product. The color, texture, and plank-width were exactly what I had envisioned for the laundry room. I don’t want to give too much away before the big laundry room reveal post that’s coming out next week. But I have to share at least one Before & After comparison, right??? It’s only been a few months since the install, but so far we are LOVING these floors! The plan is to install new LVT flooring throughout the remainder of the first floor sometime in 2017. 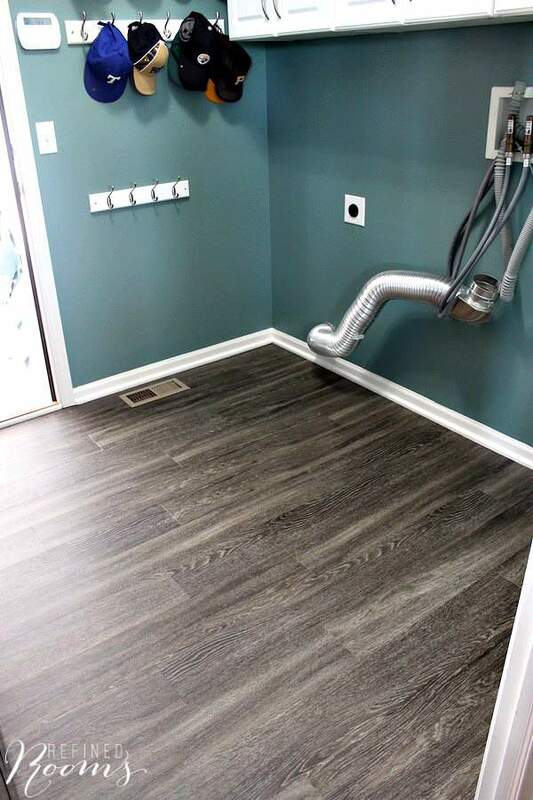 Although I’m totally in love with the grey tones of the laundry room flooring, I’m leaning towards a more classic brown tone for the rest of the house. So, I’d love to hear your thoughts! Have you used luxury vinyl tile flooring in your home? Would you consider it for a future home remodel project? Oh, and be sure to check out the laundry room makeover reveal and let me know what you think! Hello! Love the look of these floors! We are in the process of choosing the right type of flooring for our home (we have 2 kids and 3 dogs) we were thinking of tile but now im starting to think maybe LVT would be better. I love the one you picked out (thank you for sharing the name!) I also love the long white washed wood plank look that was in the samples picture would you happen to know the name of that one or where I might be able to find it? Thank you! These photos were taken over 3 years ago and I’m sorry to say that I don’t have the information on the other floor sample. I like how you explained that luxury vinyl plank flooring has come a long way, and is now basically indistinguishable from wood. My husband and I just bought an old home that needs to have new flooring put in soon, and I really want the finished product to have a feeling of style and luxury. I’m glad I read your article because I hadn’t previously considered the options that vinyl plank flooring has to offer. Thanks for chiming in Daphne. Best of luck with your new home! Thank you for this post! How would you say the floors are holding up now after a few years? How would a vinyl floor stand up to cleaning with products used to disinfect floors ? I want to use it in a dog room that may at times have a puppy pen. That’s probably a question to ask a flooring expert/manufacturer. I use Swiffer wipes to clean mine up and they work like a charm. Thank you for this article. I had a house plumbing flood that destroyed my main level hardwood floors throughout the house and the basement carpet. I have replaced the main floor hardwood (thanks to homeowner’s insurance) and am NOT going to put carpet in the basement again. Have been considering LVP for the basement, and my kitchen (currently vinyl sheet.) Was thinking porcelain tile for the kitchen (pricey!! ), but think with my research will go for the LVP in basement and kitchen. I know this is a couple years old posting, but if you see it are you still good with the LVP here in 2018? Thanks so much for this posting!! TOTALLY still in love with the LVP! I had plans to install it throughout the first floor of my home, but we’re now going to be moving so those plans were put on hold. Best of luck! If my floor is uneven do I need to level it out before using this luxury vinyl? Yes, you will. We have a few rooms on our first floor that are currently hardwood, and a few others that are carpeted. The carpeted rooms would need to be built up with plywood first to make them even with the hardwood floors prior to laying the LVT. Thanks for this interesting article about luxury vinyl tile flooring. I didn’t know that these could be installed easily and even over existing flooring. I’m kind of interested to learn if this applies for all types of floors or if some should be removed before placing the tile. Wondering if this can go straight over cement as a floating floor? I just found your blog and it has made me question my choice of bamboo. I currently have vinyl tile (everyone thinks its real tile) in my kitchen and bathroom but we want the whole first floor to be cohesive and the same. I need it to be scratch resistant so I love wood but fear it would have to be refinished in a few years. I’m by no means a flooring expert, but my guess would be yes. Any flooring experts who can chime in here? 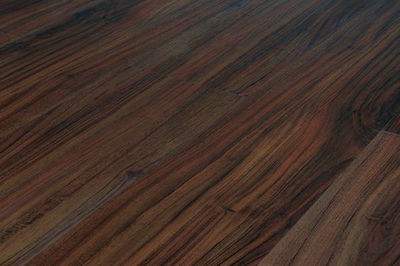 In your first sample pic the large plank that says touch and feel- could you please please tell me the brand and color? I’m searching for it!!!! Hi, Thanks for your post. Do you still like the floors durability wise? Scratches, stains, etc.? Absolutely. It has stood the test of time beautifully! Hi Natalie, In our houses main level we have a mixture of engineered hardwood and carpet and are considering replacing with LVP. We are trying to find a product that will hold up to a 80 lb Labrador Retriever. We are concerned that though it is supposed to be durable, that it will scratch? Do you have dogs and if so, how large are they? 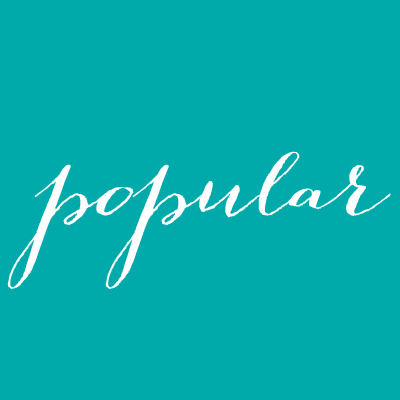 Thanks for the wonderful blog post! Yes, I do have a dog, albeit a small one (25 lbs). Not a scratch in sight on my floor from the dog. I can’t speak for how it would hold up with a much larger dog though. Maybe someone else out there can speak to this?? 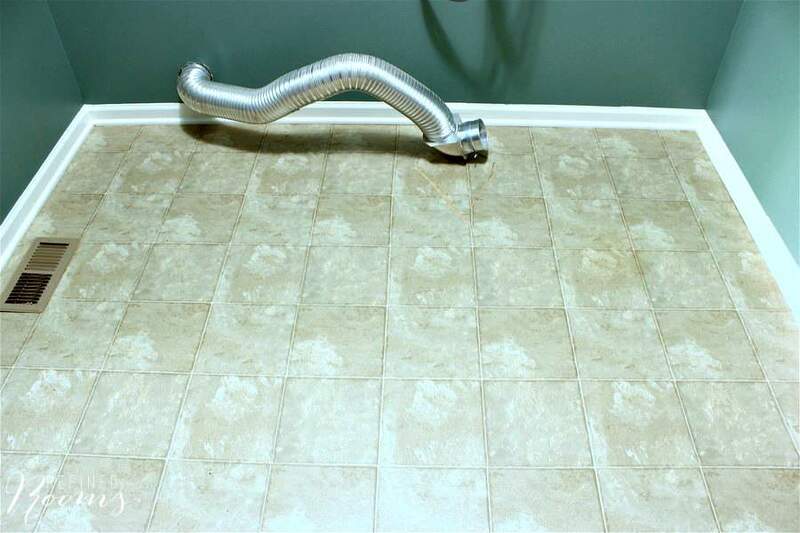 It sure got my attention when you said that vinyl flooring was as tough as nails and that you have experienced working around with it and moving appliances on top of it and yet saw no scratch on the floor. 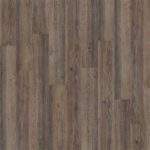 I think I will go for a vinyl plank flooring this time around. Aside from the toughness, what I have heard is that this type of floor is actually waterproof. Considering the idea that the house is filled with children who usually play with water, I think we ought to go for a flooring that’s waterproof. Thank you for sharing! My only concern is resale value. Its not that I expect more of a return….I just don’t want to install and the house be de-valued. As far as resale, it may depend on your area so it’s definitely a good idea to talk to a local realtor. However, I am a realtor, and currently in my area a lot of the higher end homes are even using this product. You never know if it will be a fad item that goes out, but for now, they have been using it for a while and continue to do so. Thanks for weighing in on this Emily. It’s reassuring to hear that! I have porceline tile down hall and into kitchen area then carpet in the adjoining living room. I would like to have LVP put over this entire area. How is the transition made laying LVP over existing porceline tile on into area that had carpet? Did you have to put a filler down in carpet area? Nancy, I have a similar issue with our existing hardwood/carpet combo throughout the first floor. We haven’t tackled the project yet, but I know that the solution will be to cover the carpeted areas with plywood to build them up so that they are even with the hardwood areas. An added expense, but still much much less expensive than using hardwood! Corner round is used only in cases where they didn’t take off the baseboard before replacing flooring, so it is necessary to hide the gap. If you are installing new baseboard, or removing before putting in the flooring and then replacing it, you do not need corner round. As long as the baseboard is wide enough to cover your space between the floor and the wall. I have tile in bedrooms that connect to tile in living areas. I’d like to update the main living areas but if i remove the tile it would be uneven. Any recommendations? My understanding is that corner round really needs to be used with non-carpet flooring. 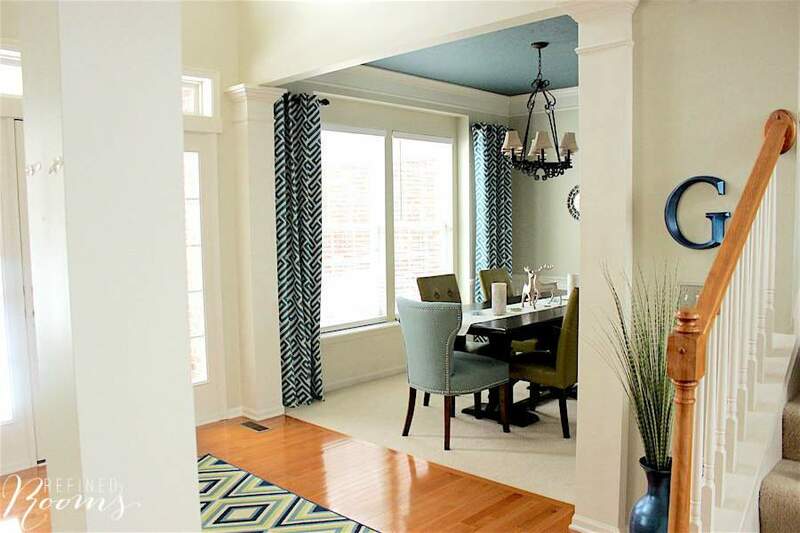 It’s not necessary with carpet, as you can typically tuck edge of carpet under baseboards. However, with tile, LVT, etc., the corner round hides the gap between the flooring edge and the baseboard. I don’t think the use of corner round is based on trends, it’s a finishing detail whose use is dependent on floor type. I use corner round in the room with my LVT flooring, and will throughout the house when it’s installed. Hope this helps! Good luck with your project! This article and the comment thread have been very helpful in my quest for new flooring! My husband and I were set on wood-like tile for the first floor in our home which is about 1,250 sq. ft. We just had a contractor in here to give us a quote on carpet for the second floor and he mentioned LVP for the first floor. Of course my immediate reaction was VINYL?!? NO WAY! He smiled and gave me a few facts about the durability and low maintenance and challenged me to do some research. Over the last two days I’ve been obsessing over researching this LVP flooring and came across your blog. 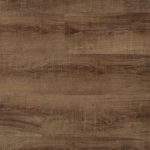 My google search was, “Why should i NOT install luxury vinyl planks?” and this blog was the first search result! I have yet to see any real cons about this flooring other than the stigma that old vinyl floor has carried. Thank you for sharing your research and experience! Little did I know when I shared my experience with this product how helpful it would be. I’ve received so much positive feedback from this post! I’m so happy that it was helpful to you Renee. Good luck with your project! hi. thank you for the write-up! Do you know if the Coretec Plus LV flooring can be glued down or nailed down? it is floating product which worries me for feel and transition bumps. we will be installing 1300 sf throughout main level of home. thanks! COREtec Plus can be installed using the floating or glue down method. 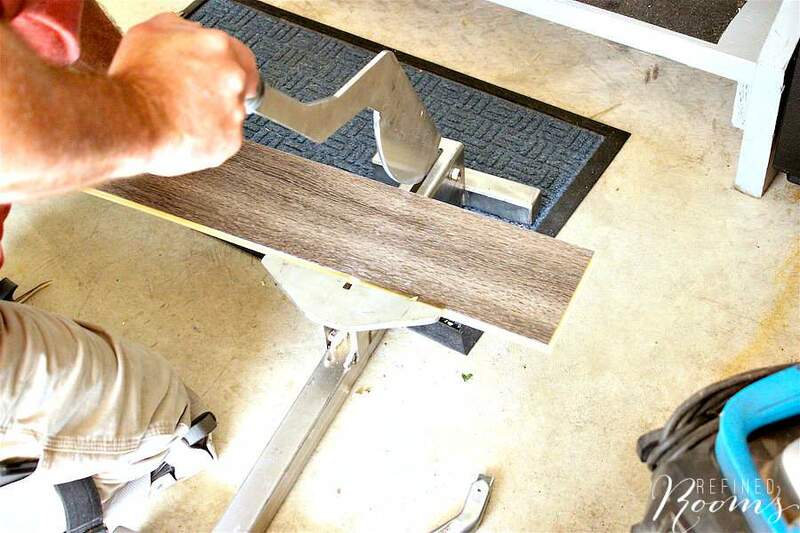 When gluing floor, use only USFloors Wood and Bamboo Flooring Adhesive over manufacturer’s recommended substrate. Turn the heat off for 24 hours before, during and 24 hours after installation when installing over radiant heated subfloors. So excited about your project! Beautiful floors, Natalie! I too am planning on installing LVF in my 3 season room. We had carpet but it is starting to wear. Since the room has just plywood, we plan on installing a thicker version to give the floor less flex under foot. One thing I haven’t seen that is an important feature of LVT, is you can install them on a concrete slab, even as a floating floor! Before that the only wood-look option was glued down engineered wood, tile, or carpeting. I work for a commercial flooring contractor, and after a recent water problem (I left the filter running!) we are having to replace all of our engineered hardwood, which run seamlessly throughout our first floor. 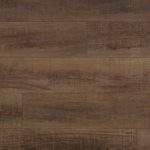 I am going with the USF Contract Stratum 500 LVT in Gallatin Hickory. It’s 8mm thick, the same as the EHW, so it will be a seamless replacement and install as a floating floor right over our concrete slab. Like you, we are using carpeting on the stairs, but it will also run seamlessly through our second floor hallway, laundry, bonus room, and bathroom. I’m so excited to have it done and get rid of those orange “honey oak” floors and the same contractor-grade beige carpeting! I tried our local version of Cottage oak in my bathroom and (open) balcony, to see if water can be a problem. So far, after some serious rainy days in Bucharest (right now is raining as well), it looks same as the first day. LVT is a wonderful project, easy to work with and a perfect final result, no gaps, no ugly and repeating patterns… I will definetly use it for the entire apartment. 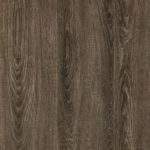 Hello, im about to purchase the Islander LVT, wanted to get your opinion since you have had your floor awhile now. I was wondering if you can feel inperfections when walking on floor and if you are seeing any gaps or imperfections? Welcome and thanks so much for the compliment! The flooring is really beautiful! They have come a long way in design for sure and I love how quickly the installation is. I did see your laundry room and it’s such a gorgeous space with the Mountain Laurel color being perfect! Thanks for sharing with us at Funtastic Friday! Thanks for the compliments Angie. Yes, I’m in love with Mountain Laurel! Steam mops are not recommended on LVT as the heat can damage the flooring, a damp mop is all you need. I have LVT planks in my kitchen they are easy to keep clean. Thanks for the info Kim! I would be hesitant to use steam mops on LVT floors as well…I just use a damp Swiffer cloth on mine and they work like a charm! We have a multi level home and are thinking of this for the main level which has 3 doors that access directly to the outside. But I want a classy look and feel since its the first view visitors have if my home. Would you recommend for an entire main floor? Kathy, that is indeed my intention for my home. I definitely love the look of it and plan to put this flooring throughout my entire first floor. I’m hesitant to put it on the stairs, since the flooring installer pointed out that it can look a bit awkward there. But it’s going everywhere else. Have you thought about going to your local flooring store and bringing a few large samples home to see how it would look in various rooms? HI! just wanted to ket you know that the new coretec Luxury Vinyl Wood Plank products now offer a flush, interlocking stair bullnose pieces…instead of a bullnose piece that lays on top of the planks, looks very fake, and has been offred by most luxury vinyl companies in the past. I have two staircases in my home and was hesitant to install LVP in my home for this reason… despite loving everything else about the Coretec HD product. We are installing in 3000 sq ft of it in our home next month…the entire main floor, stairs and some of the upstairs. I’m really excited about this product after spending 2 years searching for flooring that would meet all my requirements. BTW, we have three kids and three dogs….all of which swim a lot (we live in AZ)…and come in the house soaking wet…so being waterproof is a HUGE benefit of this product for us! Lisa, thanks SO MUCH for your comment. I’m excited to hear about the improvement in the stair pieces for LVP, because that has made me hesitant to use it up the stairs. Would you do me a favor and send me photos of your stairs when your project is completed? You may inspire me to write a follow up post on this (and change my plans for our stairs!). 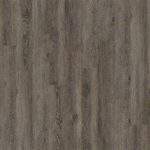 So I just discovered vinyl plank flooring, and it looks amazing! I also wish to do my entire house, but was told it cannot be used on stairs. After reading this post, I will be doing research on the stairs! My only reservation about buying this product is my concern that because it’s vinyl, it’s going to bring down the value of my home. I am actually going to be selling my home, so I obviously don’t want to do something that’s going to turn off home buyers. I live in a beautiful, middle class home in Scottsdale, AZ (2,300 sf; sale price in the range of $440k). Is there a huge stigma with this product? Or will the beauty and ease of it override any stigma? I wouldn’t blink at it in someone’s home, but I don’t want to make a mistake with it going on the market in a month or so. Any input or advice on how it may affect my home’s value/resale? Yes Brigid, since writing this post, we’ve decided to go a different direction with new flooring for our stairs. We plan to use the NuStair System instead. As far as the question regarding how installing LVT will impact resale value, I recommend talking with a local real estate professional in your area to get their expert opinion on it (since things differ dramatically across different geographical locations). Truth be told, I had similar concerns. When I spoke to several professionals in our local real estate/home building community, they assured me that there is no stigma associated with LVT in our local area. In fact, the builders said that they are installing it in high-end new construction homes routinely. We just installed CoreTec luxury vinyl planks in our kitchen and bath and I wanted to respond to Heather’s comment about water damage. She had laminate floors. This is NOT laminate, it is vinyl and ours said ‘waterproof’ right on the box. I hope this is helpful. Thanks for chiming in Amy. I’ve certainly received an education about flooring options as I’ve gone through the process of researching and selecting the laundry room flooring. 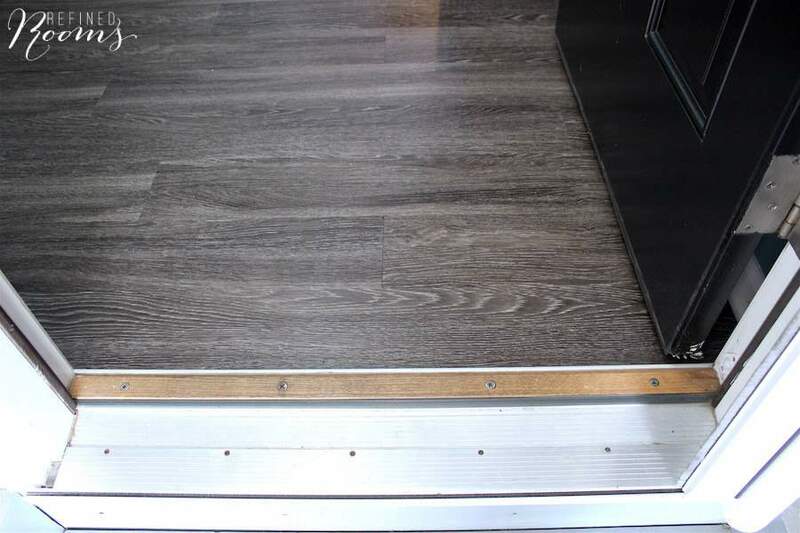 I’ve learned that there is a distinction between laminate flooring and luxury vinyl plank flooring (which was not clear to me at the beginning of this process). It may not be clear to others as well. 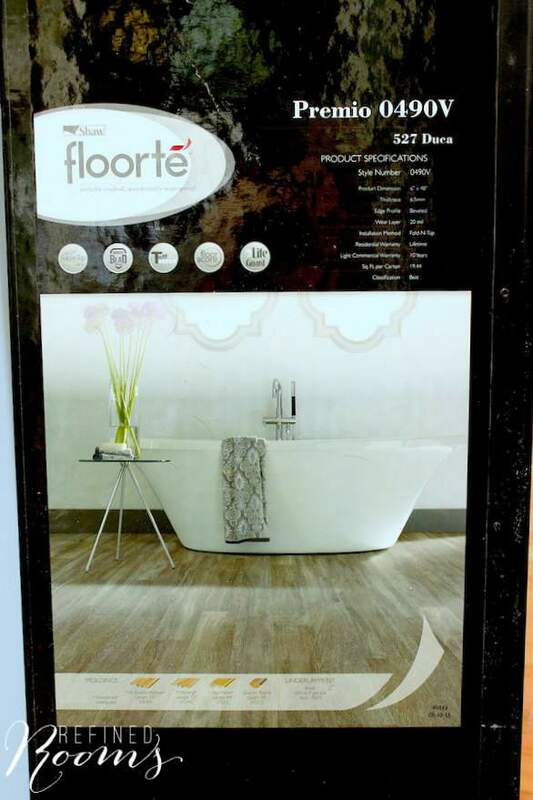 Like your flooring, the Shaw Floorte product is advertised as “waterproof”, which is not the case with laminate flooring from what I understand. laminate is good but not indestructible by any means. i have had it for 17 years & have chips where things have been dropped. i had it in the kitchen & loved it. i also have had it swell when i plant was overwatered & not noticed. we had a massive water pipe break on the 2nd floor that flooded our bedroom & all of the laminate had to be taken up & replaced. with that being said, we are moving into a new home & i am having laminate put down on the main floor, everything but bathroom & kitchen. So this would be an option for a bathroom? We have old linoleum and carpet in the master. It can hold up to humidity and wet feet/damp rugs? Can you use a steam mop on it? It looks beautiful. We’d have to take up the carpet and at that point probably the smaller linoleum area. Can it go right over the subfloor?